Pokemon Shuffle has surpassed 3.5 million downloads and there is a new special stage in celebration. This stage is Celebi, which is a Mythical Pokemon. It will be available until 6:00 UTC on 5/18/2015. Players will be able to earn 1,000 coins for the first time completing the stage. Celebi is Psychic type and has to be defeated in 20 moves. 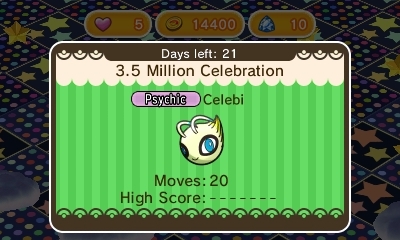 Just like all of the other Special Stages - Celebi may never return to the game so be sure to catch it while you can!